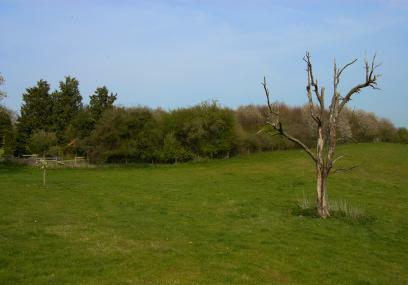 This reserve consists of a small area of young deciduous woodland plantation and a hay meadow. There are good views across the valley to Wentwood Forest. A mature pear tree is a relict of the old orchard. GWT has recently planted fruit trees to restore this habitat of high heritage and wildlife value. Evidence of what looks like horse stables and paddocks are shown in the meadow in the 1845 tithe map. It is thought that the name ‘Kitty’ refers to a horse, once stabled in the orchard. The grassland is under traditional hay meadow management with a late summer hay cut followed by aftermath grazing. This encourages species such as yellow-rattle and common spotted-orchids to thrive. The meadow is bordered by mature hedgerows with scattered large trees. A small plantation woodland is located at the northern end of the reserve, with species such as lime, oak, ash and cherry. The woodland contains an open glade which provides a good habitat for butterflies. Broad-leaved helleborine, a species of orchid, has been found growing in the woodland. Half of this woodland has been thinned in 2015 as part of the Trust's Glastir scheme. Kitty’s Orchard is an experimental site where the Trust is working to increase species diversity. Native bluebell seeds have been planted in the woodland, and grassland diversity is being restored through traditional management following strewing of green hay, taken from more flower-rich Trust reserves, at this site. Orchards are an important but declining wildlife habitat and a feature of the surrounding countryside. The area around a remnant mature pear tree has been planted with a small selection of fruit trees. There is a flat, straight path that leads from the entrance gate through the woodland and into the meadow. This path can be wet and muddy during the Winter. From Usk town centre, follow the A472 west. Just before you leave the village, take the turning to the left signposted Gwehelog. Follow this road for about 4km until you reach the second crossroads. Take a right hand turn towards Llandenny. Follow this road for about 500 meters until you reach a crossroads. Go straight on, and very soon after the crossroads, you will see the reserve entrance (a wooden gate) on the right hand side, opposite the turning to Walk Mill Cyder Farm (grid ref: SO 400 045). There is parking for one car by the reserve entrance. Priory Wood and Springdale Farm. RaglanCastle is the finest Medieval fortress-palace in Britain. The historical town of Usk contains the ruins of a Norman castle, 17th Century buildings and cobbled streets, and walks along the River Usk, which is a magnet for a wide range of wildlife. There is a flat straight path that leads from the entrance gate, through the woodland to the field. There is parking for one car at the reserve entrance.